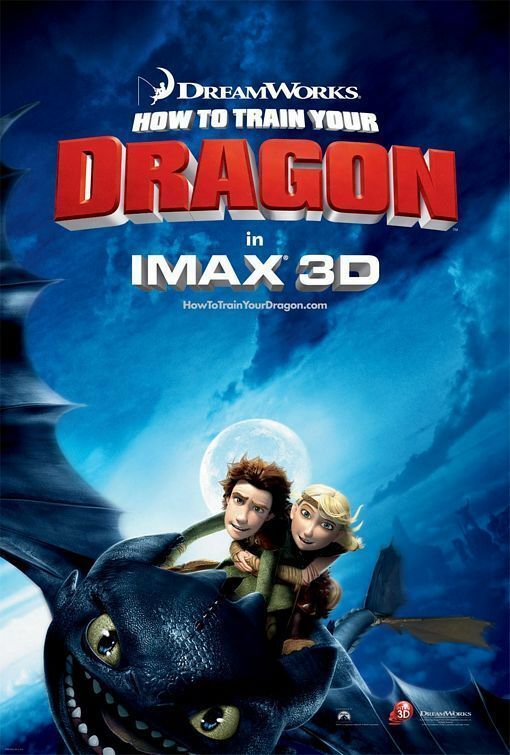 How to Train Your Dragon is a Dreamworks Animation fantasy movie based on the book of the same name. The movie is DreamWorks Animation's fifth most successful film behind the Shrek film series. We are immediately introduced to the Viking island of Berk and its inhabitants, including the Viking chief (voiced by Gerard Butler) and his awkard son named Hiccup (played by Jay Baruchel), during a siege by dragons that raid the villagers animal stock. Hiccup is desperate to win his Father’s approval and the acceptance of the village, by attempting to become a dragon slayer like most other villagers his age. Hiccup soon captures a Night Fury, a rare and greatly feared dragon that has never been seen before. However, Hiccup finds that he cannot go through with the deed of dispatching the dragon. Risking the wrath from his father and the rejection of the village, Hiccup chooses instead to train his dragon in secret, where wackiness ensues………….. The best thing about Dreamworks Animation pictures are their adult oriented storylines. This doubles the movie’s audience while also allowing viewers to see as much, or as little as they want. Opposed to the usual sickly sweet and simplistic Disney films of old, Dreamworks Animation have offered movies with layered mature themes, reaching their audience through the use of metaphor. Shrek served as a fantastic metaphor for the commercialization of fairy tales to the detriment of quality, whilst also delving into themes of prejudice and honest love. How to Train Your Dragon holds host to themes of destiny, self-confidence, father issues, empathy for your enemy and surprisingly, people dealing with disabilities. Hiccup’s hero’s journey is given a bit of a jolt as he is trying to live up to his father’s expectations in their island village, turning instead to a discovery of self. Nature overcomes nurture and Hiccup finds his greatest failure, in not being able to kill a dragon, give rise to his inherent strength: his ability to train them instead. The qualities he sees in himself as being negative when compared with others, such as his introverted, sensitive studious habits, actually soon become his tools of his eventual trade. The theme of empathy has been explored recently with Avatar, which drew from the legend of Pocahontas. In Dragon however, we are treated to the strengths of stylized cartoon imagery. Whereas Avatar boarded on photo-realistic images of a fantastical land, Dragon’s hyper-stylised characters use extremely simple expressions and characteristics to viscerally communicate emotions extremely effectively. This is a lesson the box-office bomb Final Fantasy: The Spirits Within learned and corrected with their release of Final Fantasy: Advent Children. For this reason, I felt more for Hiccup and his Dragon, both in the dramatic and the amazing flying sequences then Jake Scully in Avatar. How to Train Your Dragon is an amazing visual experience. Its style is well selected, the geography well established, the dragon construction and the animation detail is amazing. I would have loved to have seen it in 3D just for the flying sequences alone! Apart from the speedily resolved love interest and the commercial audio-tuned song at film’s end, which also irritated me with the horrible Alice in Wonderland, I actually will be seeing this again. Right up there with the original Shrek, I give this Dragon 4 out of 5 fireballs! Check out the trailer, and see what Margaret and David have to say!